With the temperature gauge in the car registering 41.8 degrees C (107 F) I recently embarked on a mission to find some specific graves in the biggest cemetery in Western Australia, having the beautiful name of Karrakatta. Needless to say some thought I probably needed to be delivered to a home for the bewildered, venturing out on such a hot day! Almost a quarter of a million burials and cremations have taken place at this vast graveyard at Karrakatta, so my visit required some forward planning. Having (eventually!) found the ‘target’ plots, I noticed reference to a Commonwealth War Graves section on the cemetery map and decided to take a look as I had never been in a war graves cemetery outside of the United States of America. The War Graves cemetery is dominated by a tall central ‘Cross of Sacrifice’. 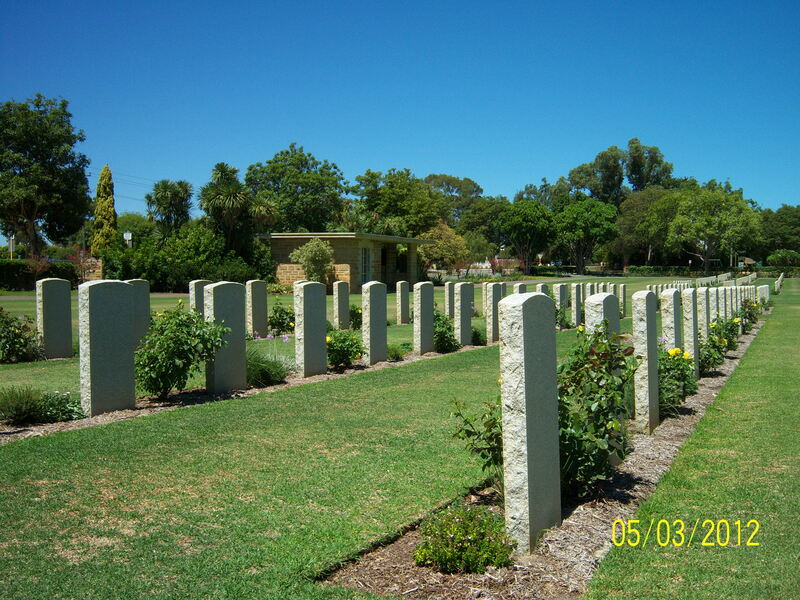 The manicured lawns and straight lines of almost 500 grey granite grave-markers are a poignant sight. When visiting any memorial, I like to read as many names as I can. Here are the tombstones of 16 WWI Veterans, 477 WW2 Veterans and 4 Veterans of the Vietnam War. Walking along the rows I became aware of a great blaze of colour off to one side of the main section. I wandered off to investigate and was truly astonished at what I found. I entered an enclosed area marked ‘Dutch War Cemetery’ and surmised that perhaps floral tributes had been placed to mark a day of significance to the local Dutch community. There was a number of small neat gravestones – each with a single rose, already fading – with some already displaced by the wind. I was puzzled to see children buried here – one headstone for a child aged 1, another for a child aged 15, the latter with a bunch of fresh flowers wrapped in a sunshine yellow bouquet. Still puzzled, I made my way towards the formal wreaths placed below a wall plaque.. 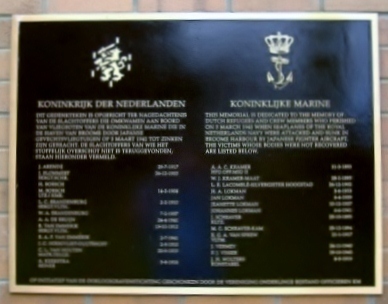 THIS MEMORIAL IS DEDICATED TO THE MEMORY OF DUTCH REFUGEES AND CREW MEMBERS WHO PERISHED ON 3RD MARCH 1942 WHEN SEAPLANES OF THE ROYAL NETHERLANDS NAVY WERE ATTACKED AND SUNK IN BROOME HARBOUR BY JAPANESE FIGHTER AIRCRAFT.THE VICTIMS WHOSE BODIES WERE NOT RECOVERED ARE LISTED BELOW….. I had not been aware until recently that Australia had suffered any enemy bombing during the Second World War. I was informed otherwise in a recent post in an excellent blog that I follow, entitled Family History Across the Seas. Read here. A post in February was on the commemoration of the bombing of Darwin in 1942 in which about 250 people died and several hundreds were injured. Just 12 days after the bombing of Darwin, the town of Broome in the northern part of the vast state of Western Australia was targeted. Broome was then a small pearling town that had become a staging post for hundreds of refugees fleeing the advancing Japanese in Indonesia. Indonesia as we now know it, was then a Dutch Colony known as the Dutch East Indies. Singapore had fallen on 15 February and as the Japanese advanced on Java, the evacuation was hasty with little time for recording names of refugees. It is estimated that up to 8,000 arrived at Broome from Java in the two weeks before March 3rd 1942, having been brought there by planes of the Dutch, American and Australian military as well as on civil aircraft. On one day no fewer than 57 aircraft arrived in Broome. Many of the evacuees would have breathed a sigh of relief to have reached the safety of Broome as it was considered to be beyond the range of Japanese aircraft. Packed into flying boats, they remained on board while being refueled before flying south. They remained on board as there was insufficient accommodation in the tiny town to facilitate the large numbers of people passing through.On the morning of March 3 1942, there were 15 flying boats in Broome for refuelling, each one ‘packed to the brim’ with Dutch people. Just after 9 am, nine Japanese planes attacked, and within 20 minutes had destroyed every aircraft in Broome harbour as well as those on the airstrip. The burning waters of Roebuck Bay were filled with screaming men women and children. Many who survived the strafing drowned in the fast flowing currents, were incinerated or taken by sharks as they tried to make it to shore. It is not known precisely how many died on that day or who they were, as there were inadequate passenger lists. Also killed were passengers and crew of an American aircraft shot down shortly after taking off. The number of victims varies between 80 and 100 but the exact number and the identity of some of them will never be known. The Japanese flew 97 air-raids over northern Australia during World War II. The bombing of Broome was ‘hushed up’ for some time as the authorities did not wish to cause alarm to the residents of Australia. In Broome at very low tide, the wreckage of the destroyed aircraft can be seen – a poignant reminder and memorial of that terrible day. 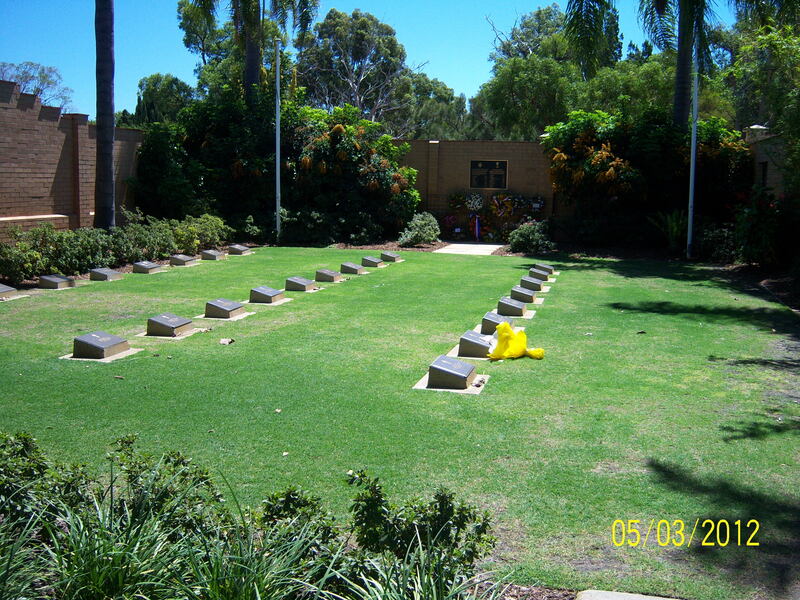 The Dutch bodies recovered were first buried in the Broome War Cemetery but were removed and reburied in a special area in the Karrakatta cemetery in Perth in 1950. I have been unable to discover the reason for this other than Perth possibly being more accessible for relatives who may wish to visit the graves. Another three graves are marked “Unknown Dutch lady”, and two are marked “Unknown Dutch child”. This story struck a chord with me as it is about emigration, one of the key themes of my blog. I concentrate on the Irish diaspora and in so doing I am even more aware of other great movements of people – migrations – across the globe. Many went on to better lives and many also endured terrible suffering, and many more gave their lives because they were in the wrong place at the wrong time. I salute the Dutch men and women who lost their lives or who lost family members in this great tragedy. 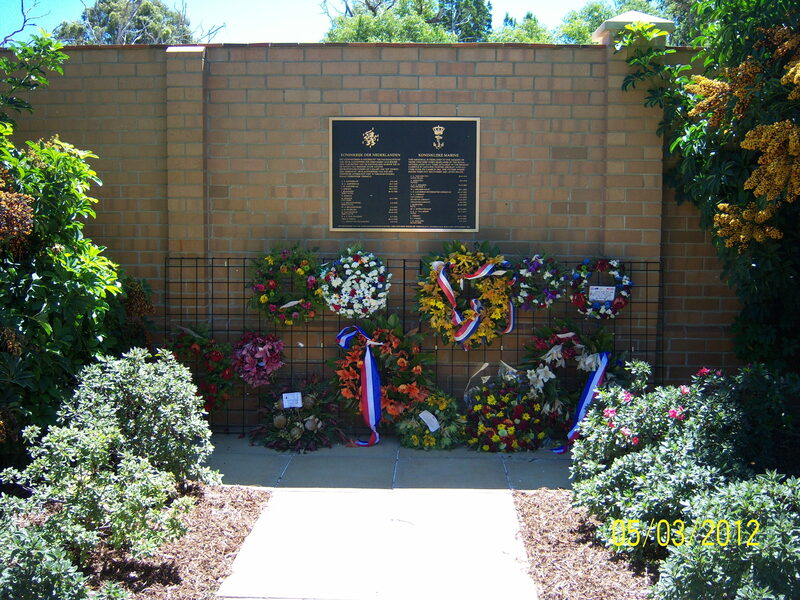 I was happy to have made this serendipitous discovery and to walk among their graves in Karrakatta cemetery, to remember them and their families who still honour them and leave floral tributes at their graves. My father, Capt. Harry W. Markey, was aboard the American plane that was shot down. He was killed, age 29. The Japanese pilot who shot down that plane was shot down and killed by a Dutch gunner on the ground. In memory too of Capt. Harry W Markey and all those who lost their lives on that tragic day. Information on burials taken from Mervyn W. Prime, WA’s Pearl Harbour: the Japanese raid on Broome (1985). Mapping the Irish Lost in the Titanic Disaster. A commemorative plaque is to be unveiled in Castlebar, the main town in County Mayo, from which the emigrants departed by train. The Addergoole community has been instrumental in ensuring that this plaque be in both the Irish and English languages – a further fitting tribute to their kinsfolk, most of whom spoke only Irish when they left their friends and family on that ill-fated journey, a century ago. The memory of the Addergoole 14 is indeed in the safe hands of the community that has not forgotten them. Well done, Addergoole!Another fine example of the excellence and dignity with which your community upholds the memory of your people! In an earlier post I wrote about the efforts of the family of a ship’s officer to get possession of the letter from their ancestor who perished on the Titanic. Now a good news story …from the delighted family of Dr John Simpson , a medical officer who also perished on the Titanic. His last letter written to his mother just days before he was lost, has been returned to his family. Bought by a generous and mysterious benefactor, this is indeed a good news story! A mystery benefactor has stepped in to ensure a valuable letter written by an officer days before he died on the Titanic will return to his home town. There were fears that the note Dr John Simpson penned to his mother onboard the doomed liner would be bought by a private collector when it was put up for auction in New York with a $34,000 reserve price. According to witnesses who survived the 1912 sinking, 37-year-old Dr Simpson stood with fellow officers on the deck of the stricken vessel as it went down. His great-nephew Dr John Martin said he was happy the letter was coming back to where it belonged. He said: “I’ve never actually seen the original letter itself as it was last in Belfast in the 1940s before Dr Simpson’s son moved away. He said the letter had been passed down through several generations until Dr Simpson’s 81-year-old daughter-in-law gave it to a Titanic enthusiast in The Netherlands 15 years ago in the hope it would go on display. However, what happened to the letter after that remained a mystery to the family and Dr Martin said relatives had always regretted its loss. They thought it was gone for good until they heard it was to be sold at Philip Weiss Auctions in New York. But the item failed to reach its reserve price at the sale earlier this month, enabling the benefactor to step in and purchase it for an undisclosed sum. It was dispatched to his mother Elizabeth who was living in Belfast’s Dublin Road. In it, the married father-of-one, who was then based in Liverpool, said he was tired but settling into his cabin well. 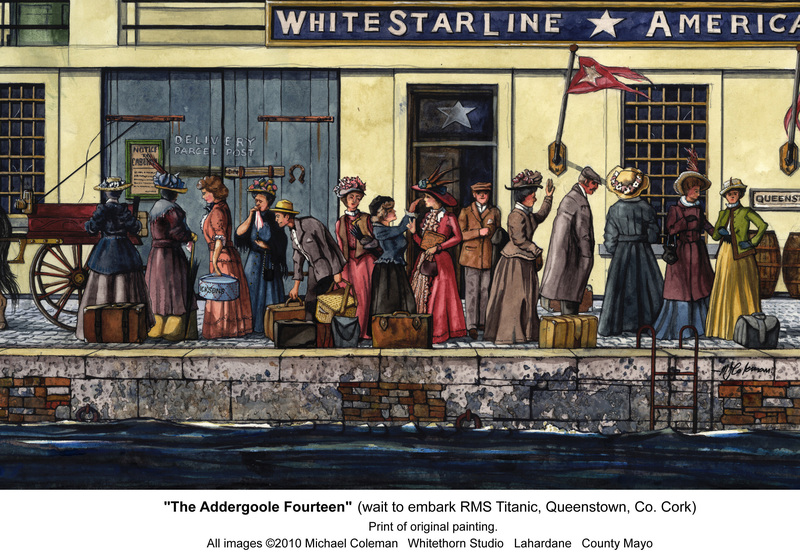 He had worked on the Titanic’s White Star Line sister ship the Olympic for a year previously and observed to his mother that the accommodation on board his new vessel was larger. Dr Simpson also complained he had found one of his trunks unlocked and $5 or $6 had been stolen from his pocket book. RTE news Item can be seen here.- Some nice scenes! A snip from my post of 2011 recalling the history of this truly international event. The first International Women’s Day was celebrated in March 1911. It had its origins in America a few years earlier where women had come together to protest against poor working conditions, resulting in a National Women’s Day being declared by the Socialist Party of America. Subsequently at an International Conference for Working Women in Copenhagen, attended by delegates from 17 countries, and including the first 3 women elected to the Finnish Parliament, a proposal to have a special day each year to focus on women’s issues was met with unanimous approval. Austria, Germany, Switzerland and Denmark observed the first International Women’s Day in March 1911. More than a million men and women attended rallies in support of women’s right to work, right to vote, right to hold public office. In 1913, Russian women observed International Women’s Day campaigning for peace and in 1914, other European countries joined in. In 1917, amid great unrest in Russia caused by millions of casualties, terrible food shortages, and with many women removed from farms to work in the factories, International Women’s Day prompted 90,00 workers to strike and the army at Petrograd to revolt. Attempts to end the unrest were not successful and Tsar Nicholas II abdicated some days later. The new provisional government granted universal suffrage with equality for women. Down the decades, the movement has continued to grow and has become a worldwide event in countries all over the world. In 25 countries it is an official holiday while in China Madagascar and Nepal it is an official holiday for women only. In many countries from Bangladesh to Guinea, from Vietnam to Iceland, from Afghanistan to Zambia, events will take place on March 8th to mark International Women’s Day. The top 5 countries for International Women’s day activity to mark the centenary on March 8th are the UK, Canada, Australia, the United States and Ireland. International Women’s Day has evolved into a global day of celebration of the achievements of women, socially, politically, and economically. Women’s rights campaigners highlight inequalities and raise money for Charity and Celebrities the world over associate themselves with the day. So girls,why not find an event near you and join in the wonderful celebration! A hand written letter from Titanic’s Chief Officer Henry Wilde is up for auction. The letter dated 7 April 1912 was penned while the Titanic was in Southampton. This is an item from the Irish Independent newspaper that has some interesting pictures. Click to read on…Titanic officer’s letter to go under the hammer on 100 year anniversary – Europe, World News – Independent.ie.